Baseball is officially back this week, and Jordan Brand is celebrating with a special retro release paying homage to MJ’s time playing America’s pastime. Growing up, MJ spent as much time on the diamond as he did on the blacktop before choosing basketball as his focus. The Air Jordan 1 Retro High OG “Barons” takes inspiration from Jordan’s baseball career with a simple white, black and wolf grey upper accented with pinstripes on the inner lining. If you’re interested in copping a pair this weekend, please read our release details below. In partnership with mall management, SELECT Foot Locker and House of Hoops by Foot Locker stores will implement a sweepstakes ticket procedure* in order to purchase the Air Jordan 9 Retro “Barons” (on sale 3/29/14 for $ 140). The sweepstakes tickets will be given out Wednesday, April 2nd and Thursday, April 3rd. If your ticket number is selected, you will be notified by phone on Friday, April 4th. These procedures are for SELECT STORES only. To find out which store near you will carry the shoe and if that store will implement the sweepstakes ticket procedure, please visit the Foot Locker Launch Locator. Kids grade school sizes will also be available. 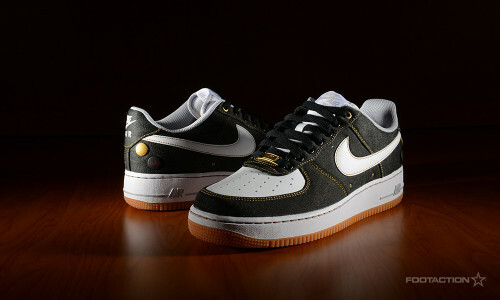 This release will be available on Footlocker.com starting at 8:00 a.m. EDT on Saturday, April 5th. Kids grade school sizes will also be available. The Kobe 9 Elite has been nothing short of high-profile since its announcement and release, and to continue the wave, the Nike Kobe 9 EM University Gold has been revealed. The sneaker is the first “low” adaption of the Kobe 9 Elite, and features a university gold upper with black and laser crimson accents. Its Engineered Mesh upper and an interior lining comprised of contouring mesh provides for lightweight ventilation and a comfortable fit. Available online only on Saturday. 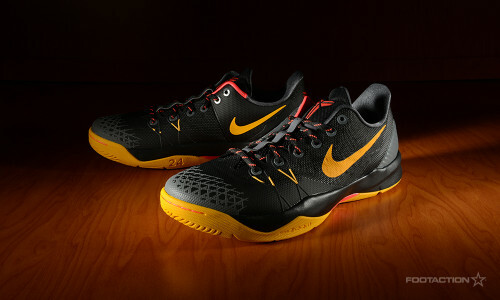 The Nike Zoom Kobe Venomenon 4 brings Hyperfuse and Flywire together on the upper, supported by Zoom cushioning. The sneaker carries black as its dominant color, with dark grey helping out on the lace fixture, eyelets, inner lining, heel counter and toebox detail. Hits of gold and crimson provide pop on the logos, laces, lower Flywire cables and outsole. For ballers who like to take their game outdoors, the outsole has an abrasion-resistant material with Blade pattern for enhanced traction. Available in stores and online Saturday. The Nike Air Raid will make it’s retro debut this weekend, 22 years after it’s original release. Labelled as an outdoor basketball shoe upon its release in 1992, the Air Raid returns in a simple yet powerful black/flint grey colorway. A black tumbled leather upper sits under crossing grey straps that give the shoe a tough look. The white midsole gives the colorway some contrast while a patterned outsole lends character to a show meant to weather the beatings of the playground game. The Nike Air Raid will drop at Foot Locker, House of Hoops by Foot Locker, and Footlocker.com (starting at 8am EDT) for $ 125. Check the Launch Locator to see which stores will have this release. 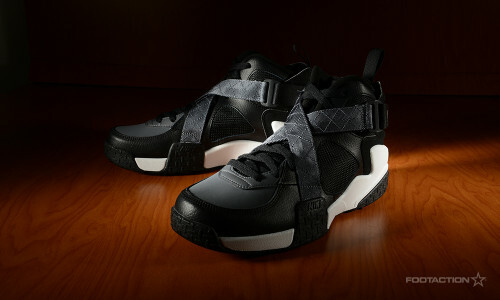 The Nike Air Raid is a 1992 cult classic performance model shoe designed specifically for outdoor play. The Raid pairs leather and durable mesh on the upper, with criss-crossing straps that literally lock the foot into the shoe. Beneath the extra-durable outsole proudly announces its intent, embossed with “For Outdoor Use Only,” a motto that’s reiterated on each heel. One of the most popular kicks back in the day and this may be your one opportunity to own them so don’t hesitate. The latest addition to the Jordan Brand’s Elements collection is Air Jordan 5Lab3. The sneaker takes the Air Jordan 3 silhouette and showcases iconic elements from the Air Jordan 5: the reflective Metallic Silver, touches of Elephant Print and subtle hits of powder blue which are seen through the translucent sole. The Zoom Kobe Venomenon 4 is back this weekend in a new clean, black and gold colorway. Simple yet sophisticated, the low-profile Venomenon 4 is a subtle addition to the Kobe basketball line and has been a huge hit among ballers and sneakerheads alike since its return last December. This newest version is a reverse colorway of the new Kobe 9 EM also dropping this Saturday. The shoe sports a black upper with pops of crimson and a gold Swoosh design and Zoom unit. Pick up a pair starting this Saturday, March 29th at Foot Locker, House of Hoops by Foot Locker and Footlocker.com (starting at 8am EDT) for $ 120. Check the Launch Locator to see which stores will have this release and let us know what you think of the shoe in the comments. You’ve seen the high-profile Kobe 9 Elite, now meet the low-profile Kobe 9 EM. This shoe’s Engineered Mesh upper provides lightweight ventilation to keep you cool, and an interior lining made of contouring mesh to provides a snug, comfortable fit. All this sits atop a Lunarlon midsole that delivers an ultra-soft, responsive ride. 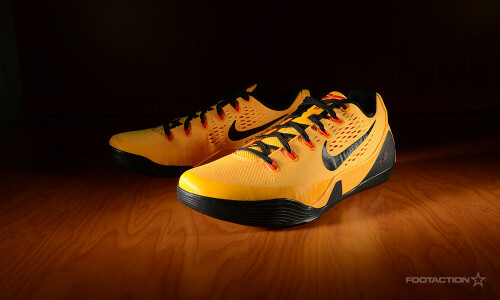 A vibrant yellow and crimson colorway accentuates the streamlined silhouette of this low-profile Kobe. If you’re interested in copping a pair this weekend check out our release details below. In partnership with mall management, SELECT Foot Locker and House of Hoops by Foot Locker stores will implement a sweepstakes ticket procedure* in order to purchase the Nike Kobe 9 EM “University Gold” (on sale 3/29/14 for $ 160). The sweepstakes tickets will be given out Wednesday, March 26th and Thursday, March 27th. If your ticket number is selected, you will be notified by phone on Friday, March 28th. These procedures are for SELECT STORES only. To find out which store near you will carry the shoe and if that store will implement the sweepstakes ticket procedure, please visit the Foot Locker Launch Locator. Grade school kids sizes will also be available. This release will be available on Footlocker.com starting at 8:00 a.m. EDT on Saturday, March 29th. The Air Jordan 5Lab3 is the newest model in the Air Jordan Elements collection. The Air Jordan 3 is a perfect canvas to showcase iconic elements from the Air Jordan 5. An upper made almost completely of reflective Metallic Silver is the hallmark of this Lab creation, with touches of Elephant Print and hits of Powder Blue. If you’re interested in copping a pair this weekend, check out our release details below. In partnership with mall management, SELECT House of Hoops by Foot Locker stores will implement a sweepstakes ticket procedure* in order to purchase the Air Jordan 5Lab3 (on sale 3/29/14 for $ 225). The sweepstakes tickets will be given out Wednesday, March 26th and Thursday, March 27th. If your ticket number is selected, you will be notified by phone on Friday, March 28th. These procedures are for SELECT STORES only. To find out which store near you will carry the shoe and if that store will implement the sweepstakes ticket procedure, please visit the Foot Locker Launch Locator. It has already been a big year so far for the Air Jordan 10 Retro with the Bobcats and Infrared releases, and now this weekend this timeless silhouette gets a another fresh color injection. Contemporary “Venom Green” pops and sockliner accents give the familiar leather and nubuck upper a lively update. If you’re interested in copping a pair this Saturday check out our release details below. In partnership with mall management, SELECT Foot Locker and House of Hoops by Foot Locker stores will implement a sweepstakes ticket procedure* in order to purchase the Air Jordan 10 Retro “Venom Green” (on sale 3/22/14 for $ 170). The sweepstakes tickets will be given out Wednesday, March 19th and Thursday, March 20th. If your ticket number is selected, you will be notified by phone on Friday, March 21st. These procedures are for SELECT STORES only. To find out which store near you will carry the shoe and if that store will implement the sweepstakes ticket procedure, please visit the Foot Locker Launch Locator. Kids sizes will also be available from Grade School down to Infant. 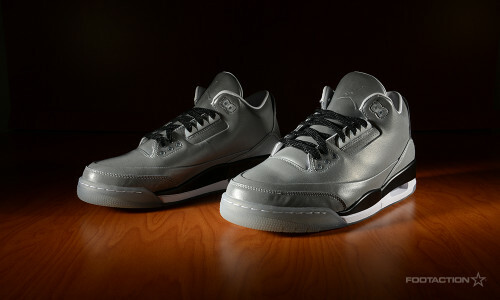 This release will be available on Footlocker.com starting at 8:00 a.m. EDT on Saturday, March 21st. Kids sizes will also be available from Grade School down to Infant.